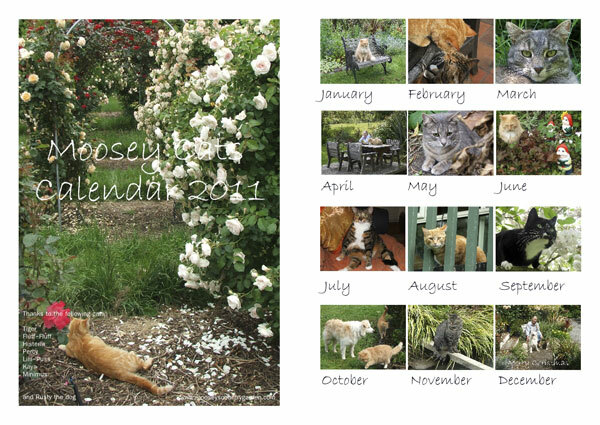 I had even more fun making a set of 2011 calendars for Christmas presents : roses, flowers, garden scenes, the cats and the dog. 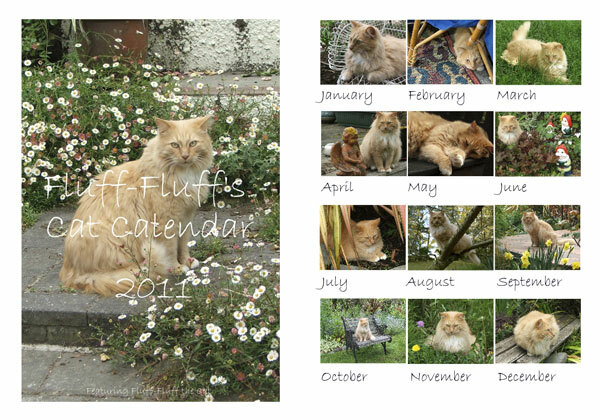 And big Fluff-Fluff the cat even had his own calendar. 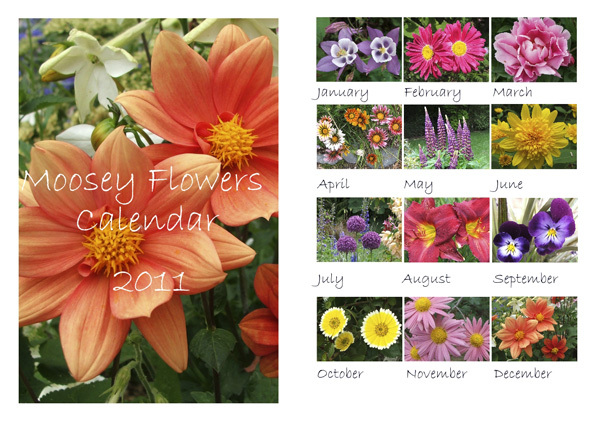 I only used photographs from my own garden - the freshest and the best for the flowers and roses. No weeds allowed! 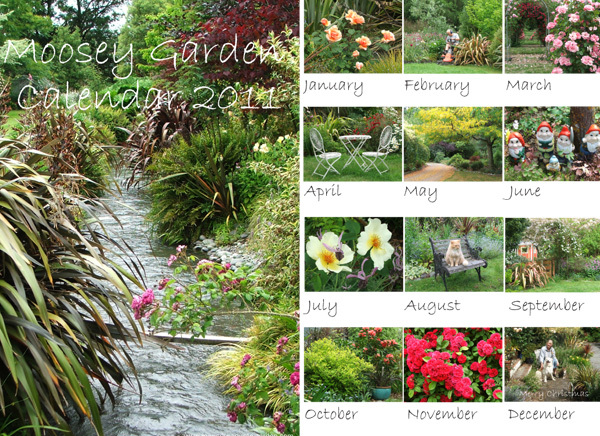 Choosing the garden scenes for the main calendar was lots of fun. It was more a case of what to leave out! Of course there had to be roses, other flowers, gnomes, and some New Zealand Phormiums. 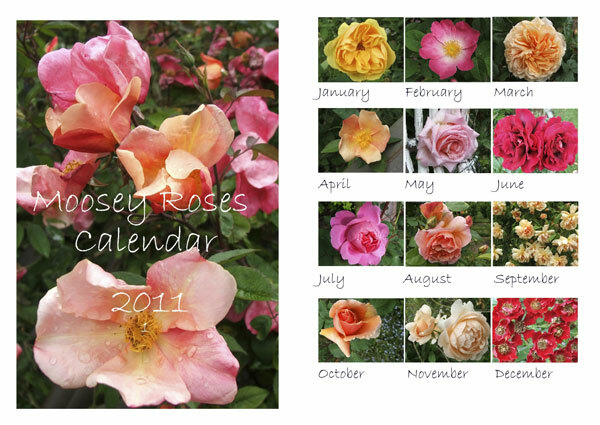 The Moosey Garden is full of roses, and it's easy to produce a calendar with my favourite rose photographs. No names, though - this is not a well-labelled garden, and like me you have to guess! I adore roses, but I like to grow them willy-nilly, in the middle of other plants. Sometimes they'll be with perennials, or foliage plants like Phormiums and Hebes. Many of my trees (poor things) have roses climbing up them, and there are a number of archways which are similarly adorned. I grow a lot of David Austin beauties, as well as some genuine old roses like Mutabilis. Pink roses, too - I love pink roses. The Moosey Garden is home to various cats and a dog, and naturally they are much loved and much photographed. My 2011 Cats and Dog Calendar featured the cats living the good cat life in the Moosey Garden. Rusty the dog had a small cameo. If you wanted to spend the year 2011 in the company of ginger Percy, Histeria the tabby, Lilli-Puss the grey, beautiful black beauty Kaya, big Fluff-Fluff, Tiger the senior cat, and young Minimus, then this was definitely the calendar for you! Rusty, the only dog, was included as an honorary cat, sharing the title of Mister October with my two ginger gardening cats Percy and Fluff-Fluff. Rusty is used to sharing his house and garden with cats, anyway. 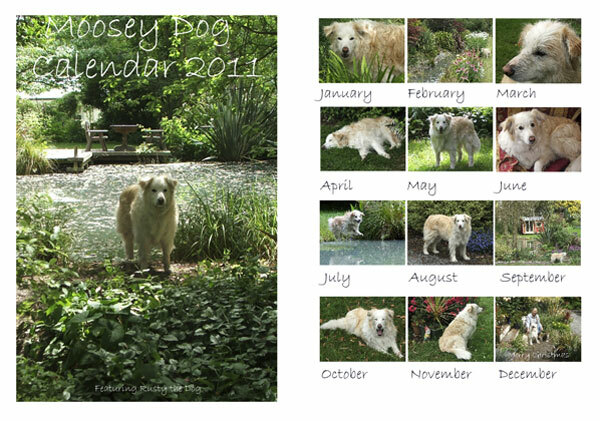 Last but not least, Rusty the dog had his own calendar. This was my special present to Non-Gardening Partner, Rusty's best friend in the whole world. Each year I make him a new dog calendar.